Captain (O-6) Craig H. Hodge proudly serves our nation with a career spanning over 19 years of successful leadership and management experience. Throughout his career he has foster innovation and technology modernization. CAPT Hodge has served as an Airman in the US Air Force, a Medical Information Management Officer in the US Army, and currently serves as a Health Service Officer (Information Technology Management) within the US Public Health Service. His experience not only spans his military experience but also the business/mission areas of the government organizations he has been assigned along with numerous functions within an OCIO organization. He has served in the fields of information security, IT operations, project management, program management, led numerous organizations within OCIO organizations, and served as Chief of Staff for numerous CIOs, providing authoritative advice to CIOs and Deputy CIOs. 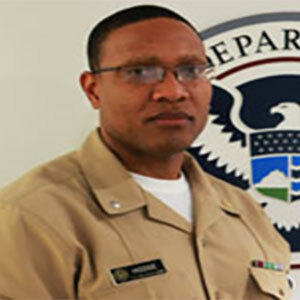 CAPT Hodge currently serves as the Deputy Chief Technology Officer for the U.S. Immigration and Customs Enforcement, Department of Homeland Security where he’s actively engaged in the cultural shift taking place at ICE OCIO to deliver at mission speed; assisting in developing and executing the ICE agile development, DevOpSec, and cloud strategy. Captain Hodge holds a Bachelor of Science in Information Technology Management from The University of Tampa and a Master’s of Science in Administration in Information Resource Management from Central Michigan University. Along with his degrees he also holds numerous technical certifications: PMI® – Certified Project Management Professional (PMP), ISC2® – Certified Information System Security Professional (CISSP), EC-Council – Certified Ethical Hacker (CEH), CSA – Certificate of Cloud Security Knowledge (CCSK), APMG-International® – Information Technology Infrastructure Library vers. 3 (ITILv3), and SA – Certified Scrum Master (CSM).